Does anyone else ever feel like poodles just have this natural confidence about them, as if they know that they’re these elegant creatures that belong on the cover of some magazine in France? No? Just me...sounds about right. It’s no wonder poodles are often referred to as show dogs, those tight curls that come in a variety of lengths, thicknesses, and even colors make them a shoe-in for the gold. Managing those locks though is an entirely different story, one filled with lots of trial and error, and often some yelping from your furry friend who may not like your brush of choice. As an attempt to hopefully eliminate any future yelping from your fluffy playmate, I have gathered up five slicker brushes, each having their own specialty so that you can pick out a brush that your poodle will love! Why are slicker brushes best for poodles? Which brushes pair well with the slicker brush? 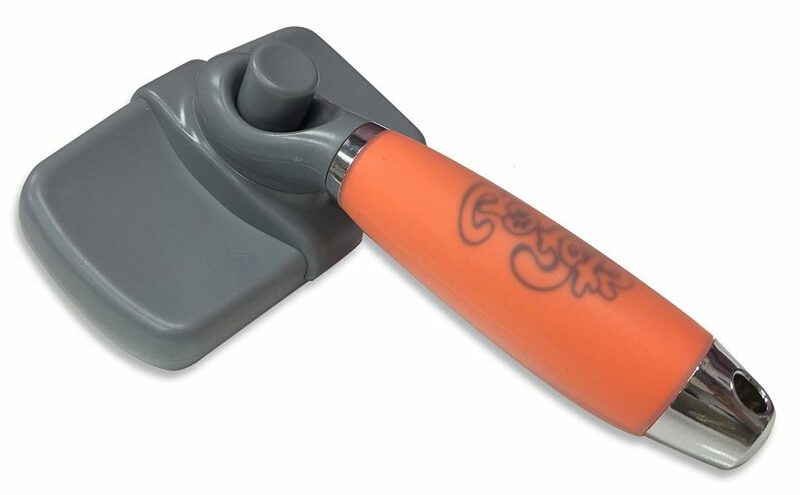 As if the adorable orange, soft grip handle wasn’t enough of a reason to buy this product, maybe the ability for the brush to work on nearly every type of poodle will better convince you. 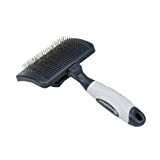 The GoPets Professional Slicker Brush contains dozens of bristles with little distance between them, making it a great product for detangling and deshedding. Although best for dogs with a medium-long coat, the brush works on poodles with short hair, thick hair, and fine hair as well. The angled bristles are comfortable so long as you remember to press gently, your dog will let you know otherwise! The easy clean up button on the back of the handle retracts the bristles, allowing you to easily pull off the wad of fur left behind and discard of it. A few users noted that the bristles were too sharp for their short haired dog, but this could have very well been due to the amount of pressure being used by the owner so just be aware. What’s with all these dog brushes having colorful, comfortable handles...why don’t my brushes have that? The Happy Dogz Pro Slicker Brush, outside of just being cute, is a great option for poodles that are prone to mats and tangles, such as thick haired or extra curly-haired ones. The thin, metal bristles are surprisingly gentle on the skin and long enough to reach that underlayer coat in certain dogs. Not only does this brush work well on standard poodles, but also Poodle mixes such as Labradoodles and even miniature poodles. 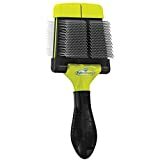 After reading way too many pages of Amazon reviews, the overall consensus is a love for the soft bristles that make their fussy dogs want to be brushed! Many poodle owners felt the width of the brush was the perfect size for large and small dogs, and the bristles were gentle enough to brush sensitive areas such as the legs, hips, behind the ears, and even the belly! The only downside mentioned was that the brush could be a little difficult to clean due to the bristles not being retractable. Coming in three sizes (x-small, small-medium, medium-large), the Evolution Self-Cleaning Slicker Brush is a great option for poodles with a thinner coat that requires less maintenance. The ball-tipped metal bristles are gentle on your dog’s skin, while the short length of the bristles is ideal for getting into your dog’s undercoat without causing any unnecessary pulling. The tight bristles make it easy to get through knots and mats in your dog’s fur with just a few short strokes as well. Many users appreciated that the brush was gentle on their dog's thin coat, as thin coats are often closer to the skin than thicker coats, so a brush with soft bristles is required and preferred. The bristles are not angled, which makes it a little more difficult for the brush to grab onto the loose fur. Dog owners whose poodles have thick, curly fur will fall in love with the F﻿﻿URminator﻿﻿ Dog Slicker Brush﻿﻿. 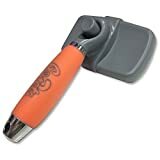 Intended for use with larger dogs that have curly coats, such as the standard poodle, the brush has comfortable bristles that aid in fluffing your dog’s fur. The flexible, angled bristles reach deep into your dog’s fur, gently ridding the layers of any mats that may have occurred over the past...well...24 hours. The FURminator slicker brush also comes in two sizes, making it suitable for both small and large poodles. The brush is two sided, one side being a slicker brush, the other side being a standard brush. This dual combination allows owners first to focus on detangling the mats in their dog’s curly fur, and then following that up by using the regular brush to smooth and fluff! A few users found that the FURminator is not ideal for dogs with a thin coat, even if it is curly as the bristles were again just too long, causing pulling on the fur when detangling mats. The Miracle Coat Slicker Brush is an ideal candidate for large or small poodles that have a thick, double layer coat. These types of poodles require a brush with bristles that are long enough to reach that under layer coat, pulling out any shedding fur and gently breaking apart those hard to reach mats and tangles. Your fluffy friend will greatly appreciate the soft, flexible bristles on this slicker brush as this helps reduce the chance of painful scratches and keeps them comfortable during grooming sessions. The brush effectively removes mats, burrs and tangles from double-layer coats with little effort and the bristles don’t seem to cause the dogs any pain. The ability to reach deep into the coat and pull up fur that has been shed was also appreciated by dog owners, as this prevented future mats and tangles from forming. If you have a thin coat poodle, this brush is not going to be your best choice. Users with this type of poodle felt the bristles were too long, making it harder for the bristles to grab onto any loose fur. A few users also felt that the bristles were too sharp for their thin-coated dog, especially around the bonier areas like the hips and legs. Slicker brushes are known for their small bristles that are close together across an often fairly wide surface. The bristles are usually soft, and some even have small, round balls at the end of them to further protect your dog’s skin from painful scratches. The bristles being close together allow for easy detangling and removal of large or small mats, which are an everyday occurrence in poodles﻿﻿﻿﻿, especially standard poodles with excessively curly fur. Dog owners who have a poodle, or a poodle mix, often find that slicker brushes work best on their fluffy friend compared to other brush styles, claiming that slicker brush is kind of like the all in one tool. Slicker brushes are also known for their ability to naturally fluff out your dog’s fur without any added effort, eliminating the need to buy a different brush for this purpose. Some people prefer to use a variety of brushes on their poodle; this is especially common in poodle’s who appear in show competitions. If you feel that the slicker brush just isn’t doing the job by itself, I recommend pairing it with a pin brush or a rake brush. Pin brushes are best used for retrieving shed fur from layers down. Most people don’t know that poodles actually shed quite a lot, but that shed fur doesn’t fall off, often due to the surrounding fur being so thick and curly that the shed fur just kind of gets stuck. Using a pin brush will help get into those layers and remove the shed fur, preventing mats or tangles from forming. This brush is best used as a finisher though and not as a tool for breaking up mats. Rake brushes﻿, which resemble the look of a dual row razor, are great for poodles that have a double layer coat. The brush is designed to reach down to the bottom layer of fur, grabbing onto to the shed fur that is nearest to the skin. Using this brush often prevents tangles deep in the fur that are very difficult, and often very painful, to remove. This tool is also great for separating the layers of fur and getting a better look at your poodle’s skin, checking for any infection, bugs, etc. The video below demonstrated proper technique for using a slicker brush so that your poodle is not matting. If you’re interested in entering your poodle into a competition, then your buying needs will be a little bit different than the needs of someone just looking to take care of their pets coat. Show dogs require an extensive amount of care, as their coat is often the primary focus in competitions. Owners looking to enter their dog into a show require several grooming brushes, the best options being a slicker brush for deshedding, a rake brush for insuring your dog's skin is free of any infection or bugs from playing outside, and even a “fluffer” brush. A “fluffer” brush is the tool used on most curly haired poodles or just poodles with a generally thick/fluffy coat. The tool resembles an afro comb that would be used on human hair and is best for final touches before your dog hits the stage. When deciding on a slicker brush for your poodle, remember to consider the length of their fur, the thickness of their fur, and whether they have curly or fluffy fur (yup, there’s a difference). Poodles with long, curly fur require a slicker brush with longer bristles, while poodles with short but thick fluffy fur require a brush with short, close together bristles. The brush you buy should be able to remove mats and tangles with ease, especially when those mats are deep in the layers of your poodle's fur. Remember to use gentle pressure when brushing your poodle to avoid causing any pain or scratching. So long as you purchase a brush that is designed for your poodle’s specific needs, I assure you, he/she will be ready for their close up!